This might be the most useful EQ chart you’ll ever find. Although you shouldn’t take it as gospel because very mix is different, it’s still useful when thinking about where your instruments might be clashing in the EQ spectrum. As you can see in the chart below all the instruments have a specific place in the frequency spectrum. 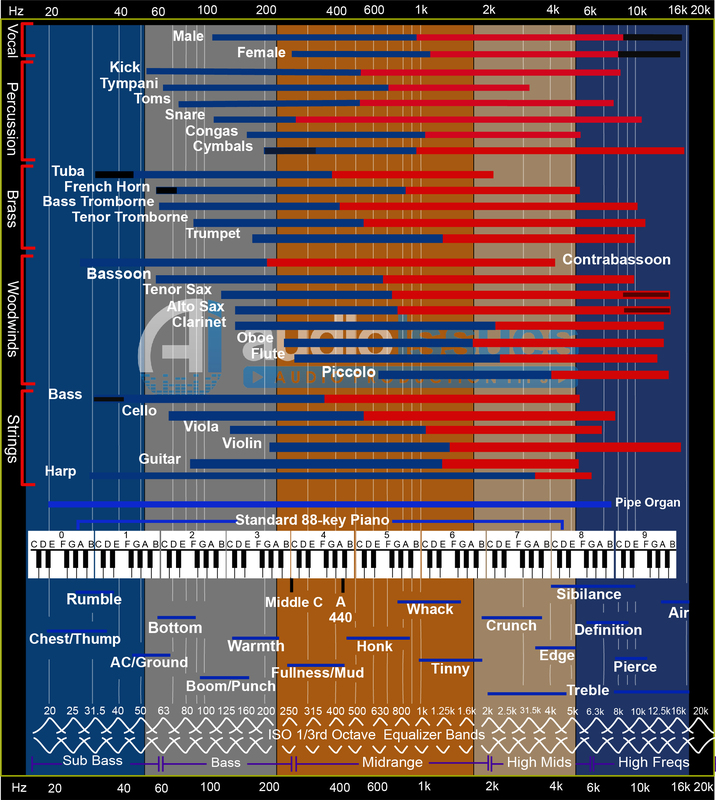 The blue color represents the fundamental frequencies of each specific instrument while the reds signify their harmonics. Low fundamentals are the blacks on the left while the black surrounded by reds represents Air. This chart is a great starting point when you want to EQ drums for additional thickness and punch, EQ bass for low-end tightness, EQ guitars to give them power and attack or get your vocal EQ under control. By looking at the various instruments you can see where their most important frequency information is. Here are a few simple things you can do to make this EQ chart help you improve your EQ skills. It’s easy to see how far you can filter a specific instrument. You can see what instruments can potentially clash, and where you might need to trim and cut their frequencies. All the technical jargon from ‘thump’ to ‘air’ is there for you to learn. All the instruments are conveniently grouped into their corresponding ensembles. With the handy keyboard layout you can see what frequency range each note represents. Understanding the EQ spectrum is a daunting task. But learning how to EQ properly is one of the most important skill to learn in audio production. Equalization is probably on every track in modern recording. There is always something added, cut, or filtered. However complicated the jargon may sem, the theory of equalization is a simple one. There are only three simple principles you must adhere to when you are EQ’ing your tracks. Filtering means completely cutting out a frequency from a certain frequency. Filtering out the low or high frequency are the most common. These filters are called either High-pass filters/Low Cuts, or Low-pass filters/High-cuts. Other filters include band-pass filters and notch filters who either only leave the desired frequency and cuts all the other(band-pass) or completely cuts out one certain frequency(notch). Subtractive EQ repairs problematic sounds, meaning that you find the problem frequency and cut down on it, either completely eliminating it or reducing it until it ceases to be a problem. Sometimes recorded instruments need a bit more shine in the mix. Adding to certain key frequencies in a sound source can make them more present or add certain characteristics to the sound source. Examples include adding a lot of 2-4 Khz for a metal-type kick drum or 5 Khz to make the vocal more present. Equalizing, along with compression, is often the first step engineers take when they start their mix. By using these simple principles, these hot-shot engineers paint a picture with equalization, making everything nicely together. Before you do that you’ll also need to know where to look in the frequency spectrum. Let’s do a quick run-down of the frequency spectrum so you can get up to speed on where you should look whenever you have an annoying frequency problem you need to fix. By recognizing what certain frequencies sound like, you’ll become faster and more effective at EQ’ing your mixes. The lowest frequency range adds fullness to those bass instruments like the kick drum, toms and bass. Cut in the 50 – 100 Hz area if they are getting too thick and interfering with the clarity of the low-end of your mix. It can also add extra punch to dance music, because it adds a dimension of “feeling” the bass instead of hearing it. Of course, you’ll need pretty juicy, low-end speakers for this. If there’s too much rumble in your mix, I would recommend cutting or filtering some of this area. Boosting here will give the low-frequency instruments a ‘harder’ sound. It adds fullness to guitar and snare. Too much can also clutter up and add boominess so cut in this area for added clarity in the low end. It also adds warmth to piano and horns. I like calling this the muddiness frequency because I always used to cut it so much when I was doing live sound. It really adds muddiness to live venues but it can also fill up your mix in a negative way. However, if you need to boost, it will add fullness to vocals and snare as well as give your guitars a thicker sound. If you’re still struggling with muddiness, subtle cuts in the master EQ can help reduce unwanted thickness. Cuts here will increase punch for kick drums. It’ll reduce boxiness and give it a thicker sound. Boosting at 400 Hz can add clarity to bass lines, especially when you’re mixing for smaller speakers. Boosting 700 – 900 Hz can bring out the bass line without cluttering up the low end. You’re targeting the upper harmonics to make them audible in the mix, all while leaving the bass sound itself alone. Reducing 800 Hz takes out the cheap sound of an acoustic guitar as well as reduce the DI sound of plugged in acoustic guitars. Boost 1.5 kHz to increase the string sound of the bass guitar. Cut to reduce nasal sound of vocals.. 3 kHz adds attack to most everything. Gives you more punch out of your acoustic guitar chords. Gives presence to piano parts, especially if you’ve needed to cut its low-end. It brings out the clarity of the voice. It helps to cut the electric guitars here to make extra room for the vocal if you’re having problems with them clashing. Boosting between 2 – 4 kHz brings out the beater of the kick drum. Adds extra presence to vocals. Brings more attack to the tom drums. Cuts will make instruments more distant so cut here if you need to pull something back without using volume. Use a de-esser targeting the frequency range between 6 – 8 kHz to reduce sibilance. Exact frequency range depends on the singer. Boosting can add extra life to dull vocals. Boost for more “finger sound” on acoustic bass. Increase to add sharpness to synthesizers, rock guitars and piano. Most everything above 10 kHz adds air and high-end ‘sheen’ to instruments. It doesn’t always sound good so don’t go boosting everything up there excessively. It can quickly result in a trebly and obnoxious high-end craziness. If that EQ chart isn’t enough and you want more EQ information, get my free EQ cheatsheet that gives you over 70 different tips and tricks on creating balance and definition in your mixes. “…exactly what I needed to get back into mixing. Before, I never knew how important EQ’ing is, the funny part? I went to school for Audio and never surgically got into EQ like this EQ Course did. This EQ Course gave out tons and tons of information for free, I honestly think this course was a steal :-O! I saved all the emails, along with the PDF file that came with the end of the course, so I can always come back to in case I get stuck with creating space in a mix. I check my email everyday and feel like I have a personal Engineer mentoring me. Now I’m mixing clearer mixes, without all the plugins I thought I needed to be one of the greatest mix engineers.” -Roman Shine. Audio Engineer.